Address: Different Location Pick-up Points. Operating Hours: Daily 10:10 am - 2:30pm during the Winter, and at 10:05am hours to 6:05pm during the Summer. 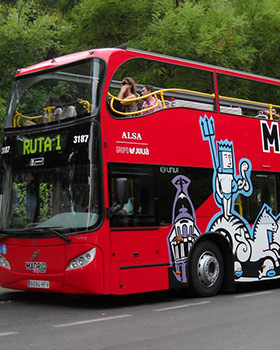 Madrid City Tour is the only official Hop On Hop Off tour bus in Madrid, which offers you the chance to get on and off the tour bus as many times as you like. It has an open-top deck so that you can enjoy a panoramic view of the city. The HOHO tour offers an audio service in fourteen languages and a special channel for kids. The Hop On Hop Off bus includes a tourist guide, a free mobile app, free Wi-Fi on-board, air-conditioning and an open roof fully or partially.